It’s weird, but I feel like my move is kind of the start of a new chapter in the story of my life (lol I couldn’t think of a better way to phrase it). I actually haven’t started packing, as I kind of dread the idea of sifting through my things and figuring out whether it’s coming with me or staying behind. The one decision that I made that will haunt me is the fact that I will be leaving my cat behind with family, until I have reached some form of stability in my new surroundings. I love my cat – she’s my baby. I know coming back for her after I’ve settled down is the responsible choice for me and for her, but it’s gutting to think I won’t see her for a couple of months at least. I also worry that she will be taken care of properly. I worry a lot. About everything. All the time. 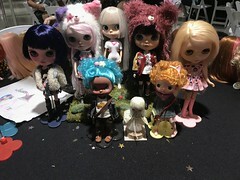 On a lighter note, I also feel sad leaving some of my dolls behind. (Of course, they will be shipped to me at a later time.) I’ve decided to bring my three custom girls with me, I guess for the fact that they are more fragile than my stock girls, and they are also a bit more fun to photograph, since they have such different expressions from one another. 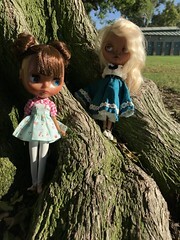 They’re also quite comforting to me… I think it’s because Finley was my first Blythe, who I’ve been through a lot of firsts with, and Marina and Prisma were gifts from very dear friends whom I connected with through the hobby (so they’re kind of like my good luck charms). I will miss having Reese and Elowyn around for the time being… Which is why I’m bringing these two girls to the next Blythe meet I’m attending this weekend! I won’t be keeping her in this outfit for the meet, but I thought Reese looked quite cute in her blue and orange ensemble, and I wanted to share ^^. Ah… Life is nerve-wracking and time just kind of flies by. As it was, I kind of felt like most of the past few years of my life were spent in continuous black and white accompanied by white noise and the sound of my own anxiety. When I think about the alternative of spending any more years like this – stagnant, living within the same 10 mile radius I was born, spending most of my time at a job that seems like a waste of time, just kind of hoping that things would change or get better without me having to do anything, I realize I’m making the best choice for me by making changes in my life. I hope to keep updating my blog regularly during my transition… But know that if I disappear for a bit, it will not be for long! I had a particularly hard week last week, made worse by a particularly terrible first session with a new counselor, who instead of helping me with my anxiety increased it by tenfold. I was relieved when the weekend came (but you know, also anxious because of how quickly time is passing by). Instead of falling into a stress-induced rut, I decided to get crafty. So I made a big KnitPicks order (because that’s what I do when I’m feeling down- I eat and spend money), which includes two skeins of bare yarn for hand-dyeing! I was really inspired to attempt dyeing yarn after watching an episode of the podcast Knitting with Dolls. I did some more research and found these tutorials quite useful (KnitPicks, Chalklegs, Instructables). I was just like, ALRIGHT LET’S DO THIS. (/insert World of Warcraft reference here). I also made some more shrinky dinks (my sister asked for Neko Atsume ones) and some dish clothes (for my mom). I really enjoyed making the dish cloths, and followed this pattern in order to achieve that waffle look. They’re a bit sloppy, but I made them with scrap yarn, and they’re not meant to last forever. 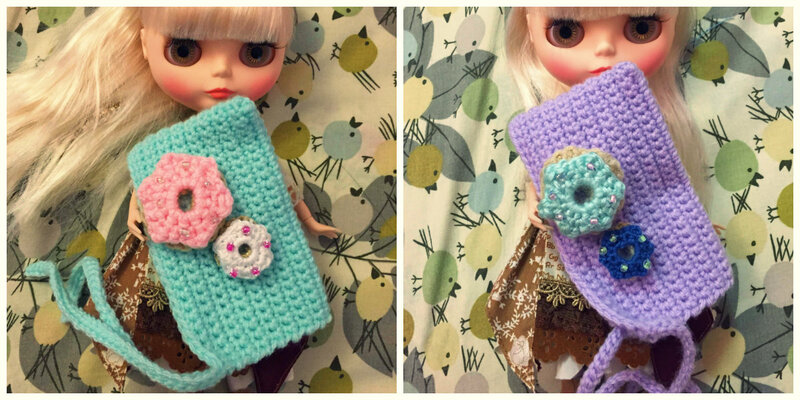 One more thing I want to mention – :3 I received the swap package I mentioned from my dolly friend. I was anticipating its arrival because I like to stalk my packages on the USPS website. I was ecstatic when I saw the contents of the package. My friend and I did a swap – crocheted and knitted things for sewn things. I’m blown away by how well-made the shirts and the dress are, with all the tiny details (tinnnyyy buttons), and the adorable fabrics. She also made the kanzashi style hair clip. I don’t have enough shirts in my doll wardrobe, nor long dresses, so these are welcome additions. The package really brightened up my day. ^^ I put the two shirts on my girls, and haven’t decided who to put in the red dress (I’m torn between Finley and Rory). Reese is wearing the pink shirt and hairclip from the swap, a tutu from MINIJIJO, white tights, and pink shoes from QMagicDoll. Elowyn is wearing a beret I knitted, the green shirt from the swap, jeans, and stock shoes. I hope everyone has an awesome (rest of) Sunday, and Monday flies by painlessly. I have a three day weekend!! I love three day weekends, because during weekdays I never feel like I have enough time to do all the things I want to do. I always feel rushed, and before I know it, it’s time for me to sleep. On weekends, I try to plan out my days to maximize the free time I have, whether it’s finishing projects, running errands, cleaning, or starting something completely new. Speaking of which… The saran hair I ordered came in the mail today! I’m planning on rerooting a scalp I purchased from Cool Cat (still waiting on the scalp). I’ve been wanting a new scalp for Rory, as I wasn’t happy with the way I cut her hair. My IRL Blythe friend mentioned she really wanted to try rerooting with thermal saran, and so I took this as an opportunity to reroot as well! I’m hoping to have like… a reroot party… where we just turn on a movie, and reroot scalps together XD… and complain together maybe? (my idea of fun). I’ve decided to go with a mostly pink scalp with streaks of mint and yellow. I didn’t want to do just a one hair color reroot, because I feel like it would be better to just buy a fake scalp on eBay. I also wanted to keep Rory pink haired, since I’ve re-homed my other pink haired girl. I imagine that rerooting will probably take me some weeks… maybe months. I’ll make progress reports! I am also planning on giving Reese a hair spa this weekend. It’s long overdue >_< . Also, that white sweater she’s wearing is the official spa day apparel in my home. Since it’s white, and made of a pretty sturdy cotton material, I don’t mind if it gets a bit wet while Reese’s hair dries. Hopefully, I’ll be able to keep the slight wave in her hair after the spa. I might put her hair in curlers. Last doll related thing – I redressed my girls! Sometimes, I feel like I have way too many articles of Blythe clothing. Redressing my girls helps me edit their wardrobe, and figure out what I want to sell and what I want to keep. Even though I’ve accumulated quite a bit of clothes, I find I struggle to coordinate the pieces into outfits I’m happy with. More often then not, my girls are dressed in clothes that I don’t think are really their style. Ah well. WA-PA-PA-PA-PA-PA-POW Is it terrible that I want that song to come back? XD All the hats above are available in my etsy store. 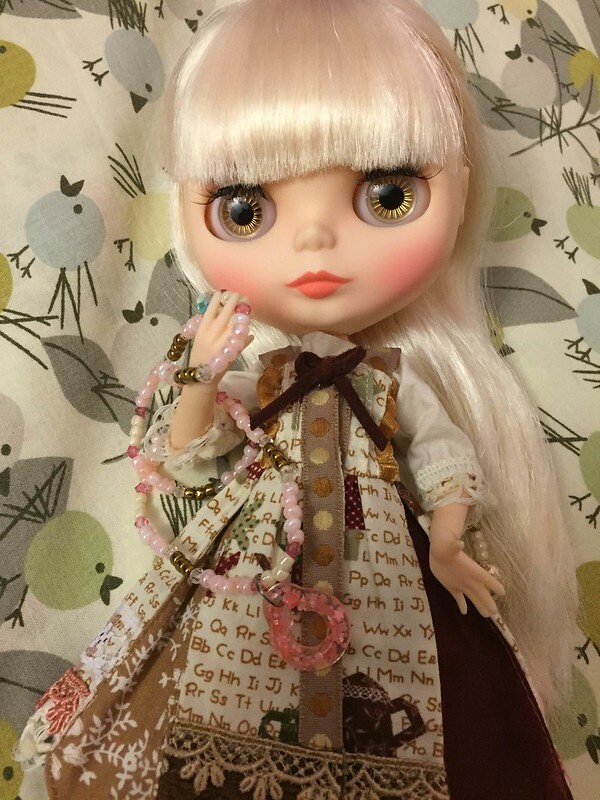 In other news, I’m really freaking excited about the new release information for the Blythe Cherie Babette. Number one. She’s an FBL. Number two. SHE’S TRANSLUCENT. WHAT? Number three. That kigurumi though. Number four. She has bobbed brown hair! 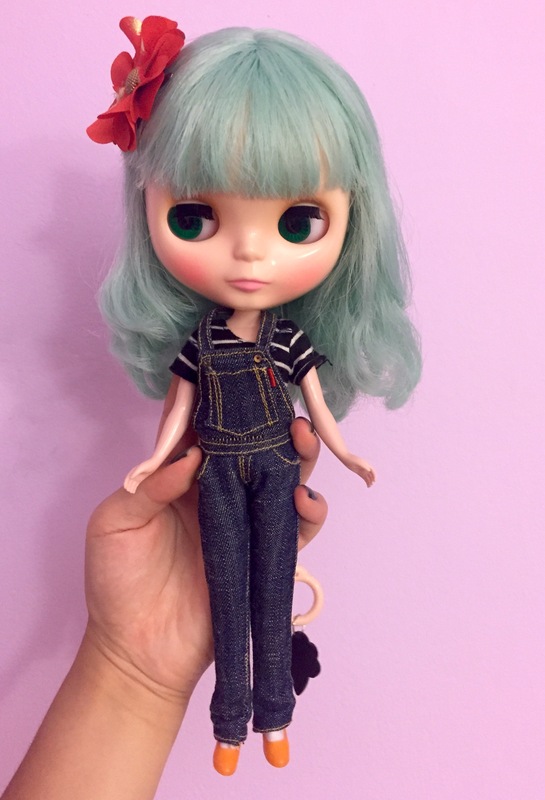 Oh man, if you guys only knew… XD I’m actually receiving a blythe doll for Christmas from my sister that is an FBL. I’ve been wanting to own an FBL, and a Translucent skin blythe… and now they’re coming out with a doll that is both! I’m also a big fan of the bobbed hairstyle ^^. It makes for very easy hat modeling. At the moment, Rory is my go-to girl for modeling hats, because of her no-fuss short hair cut. I’m feeling a bit of a shift in my own doll collection. I don’t think I own that many dolls (right now, here’s the headcount: Marina (my Project Dollhouse custom girl), Finley (my Cadence Majorette who is currently with Chantilly Lace for customization), Rory (a factory girl that I customized), Rosaline (a TBL+ that I customized), Merry (my Licca chan), and Marshall Lee (a currently bald Azone/Obitsu hybrid that I’m customizing). But with plans for moving in the future, I don’t want to worry about transporting a ton of dolls with me. For this reason, I’m trying to keep my doll population controlled to a reasonable number. I’m feeling that as of late, I’m favoring stock dolls over custom ones, and certain customizers over girls I’ve customized. I feel sad at the thought of letting any of my girls go, but as of now Rosaline is definitely looking to travel. In the future, I most likely will reshell her, as Rosaline is kind of an OC of mine XD (it feels weird to be using the term “reshell” since I’ve only heard it in the context of the BJD hobby). Monday down. Only Tuesday, Wednesday, Thursday, and half of Friday to go. I’m kind of obsessed with making puff stitches. Puff stitch, how do I love thee? Let me count the ways. Puffs eat up a lot of yarn, which is awesome because I’m currently trying to work through my yarn stash. I’ve accumulated a ton of yarn since I picked up crocheting, and I’m on a low buy (was going to write “no-buy”… but who am I kidding?) for yarn skeins. They’re so darn cute! – I tried to explain why I thought they were cute, but I can’t seem to convey my feelings without reading as a huge weirdo. They add an interesting texture to the piece. I find these types of stitches less monotonous than simpler stitches. Also, I fall back on the puff stitch so often, that I’ve developed a rhythm to crocheting it. I also think they make anything look cozier or more luxe. 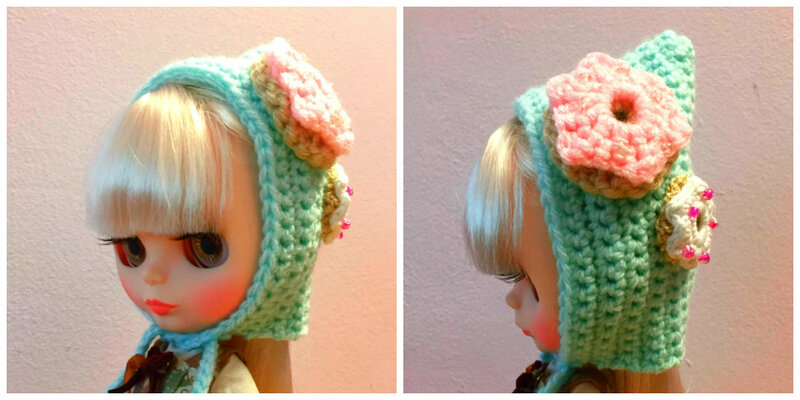 I think I’ll be adding some more puff stitch hats to my etsy shop. XD The green one looks like a Christmas tree! I got really excited when I thought of making the green hat at work. I’m not completely happy with how I’ve attached the star to the top of the pixie hat, so that one is joining my blythe hat collection. The yellow one is listed in my store. My girls are becoming quite festive this holiday season with their winter themed hats. Also, VERY EXCITING NEWS. 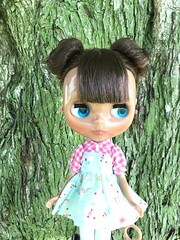 Finley has been shipped, and she’s coming home after her makeover by Chantilly Lace. I can’t wait to share photos of her and re-bond with her (because to be completely honest, she looks like an entirely new blythe now). So I’ve been in a bit of a crocheting slump lately. It’s been some weeks since I’ve purchased a new skein of yarn, which might attribute to some of my lack of excitement for crocheting. A lot of the time, I’ll see a skein of yarn at Michaels and think of how gorgeous the yarn would look when made into a hat or scarf for me or my one of my dolls. Since I haven’t added any new skeins to my stash, I’ve been working with and looking at the same balls of yarn day after day. I guess my brain is desensitized to the colors and textures I own. At some point during this winter, I do want to take on a rather big project – I want to make myself a sweater! I have 12 skeins of this rich, mid-tone blue satin sport yarn just sitting in my stash untouched. However, I need to mentally prepare myself for this kind of thing. I imagine making a sweater will take a while, and long projects are sort of a marathon for me. They test my endurance, and patience to look at the same thing hour after hour. I’m also the type of person who doesn’t like to have multiple crochet projects in the works at once, so that doesn’t help at all. And since I had this sweater project in mind, of course, my brain tells me to procrastinate in crocheting a sweater by crocheting other things! Animal-eared headbands! The deer headband was pretty annoying to make. The yarn for the antlers and the ears were kind of a pain to work with because of how thin they were. It was totally worth it though! I really like the deer motif for my dolls, and it’s perfect for Christmas ^^. I think I’ll be adding these mobius-style headbands to my shop, because I’m pretty pleased with how they came out. I’ve actually made a considerable dent in my yarn stash this past month, making gifts for my friends and family, and also crocheting little things for blythe dolls. I hope to keep busting through my yarn skeins, and then I shall reward myself with something kind of luxurious – like a skein of nice alpaca yarn. I’m slowly working through my yarn stash! ^^ I finished one skein making the light blue pixie hat yesterday, and I’m almost through a small skein of tan colored yarn that has gold running through it. I recently got a Michaels gift card, so I will probably be adding to my stash soon, but still! It feels good to have used a skein up, especially one that’s been in my stash for some time. I also decided to make a kitschy-type bracelet (for me) with the mini pull ring from the Twiggy Twiggy set I purchased for Rosaline’s pull string. I wanted to use up some of my seed beads, as I’ve only used them to decorate Rosaline and Finley’s pull strings so far. I kind of like it!.It’s cute in a kind of summer camp way lol. ^^ As usual, I can’t wait for the weekend! I plan on doing some carving (I got my Cool Cat order for some more carving tools) and some coloring! Olive – adult by weekday, living my best life on the weekend?